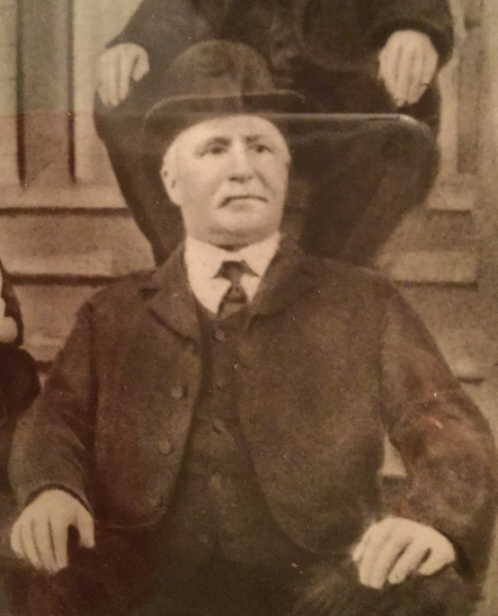 [S783] JR Reid, Ancestors of Donald James MacFarlane #0001, page. Birth*: Christina was born circa 1700 in Inverness-shire, Scotland. [S783] JR Reid, Ancestors of Donald James MacFarlane #0001, page 10. [S9] Births, Church Record, June 1977 to September 1944 St. Joseph's Church, Margaree, Records, page 72, line 13. Language*: Angus Collins spoke English. Biography*: The 1871 Census lists Angus as a student, going to school. The 1891 Census lists Angus as a merchant, employing three people. He could both read and write. The family lived in a two and one half story eleven room wooden house. The 1901 Census describes Angus as a merchant and an employer, working on his own account. He is again said to be able to read and write and lists English as his mother tongue. He is not listed as able to speak French. His 'Racial or Tribal' origin is Irish. [S5] Marriage, Church Record, November 1884 to September 1935 St. Joseph's Church, Margaree, Records, page 88, line 13. 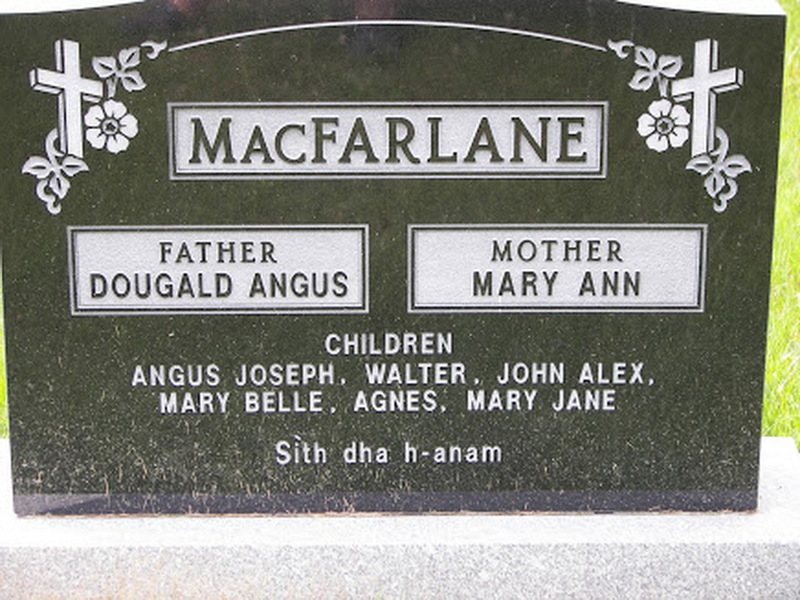 Language*: Mary Ann MacFarlane spoke Scotch Gaelic. Married Name: As of 2 October 1927,her married name was Gillis. [S9] Births, Church Record, June 1977 to September 1944 St. Joseph's Church, Margaree, Records, page 20, line 17. Religion*: Angus Joseph MacFarlane was Roman Catholic. Biography*: According to the 1891 Census Angus could both read and write. The 1901 Census says that Angus could both read and write in English, but not French. [S9] Births, Church Record, June 1977 to September 1944 St. Joseph's Church, Margaree, Records, page 2, line 16. Language*: Catherine Ann MacFarlane spoke Scotch Gaelic. Biography*: The 1901 Census says that Catherine could both read and write in English, but not French. This census lists her date of birth as July 15, but contemporaneous Church records are accepted. Language*: John Peter MacFarlane spoke Scotch Gaelic. Biography*: According to the 1891 Census John could read. The 1901 Census says that John could both read and write in English, but not French. This census lists his date of birth as May 17, but contemporaneous Church records are accepted. John was in Seattle, Washington at the time of his brother Walter's death in 1927. [S9] Births, Church Record, June 1977 to September 1944 St. Joseph's Church, Margaree, Records, page 8, line 17. The National Archives at Washington, D.C.; Washington, D.C.; Manifests of Alien Arrivals at Blaine, Washington, 1924-1956; Record Group Title: Records of the Immigration and Naturalization Service, 1787 - 2004; Record Group Number: 85; Series Number: 2675039; Roll Number: 014. National Archives and Records Administration (NARA); Washington, D.C.; Naturalization Records of the U.S. District Court for the Western District of Washington, 1890-1957; Microfilm Roll: 151; Microfilm Serial: M1542. Religion*: Mary Isabella MacFarlane was Roman Catholic. [S9] Births, Church Record, June 1977 to September 1944 St. Joseph's Church, Margaree, Records, page 12, line 9. Religion*: Duncan Walter MacFarlane was Roman Catholic. Language*: Mary Jane MacFarlane spoke Scotch Gaelic. 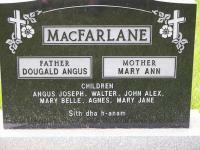 Married Name: As of before 1930,her married name was MacLellan. Language*: Malcolm John MacLellan spoke Scotch Gaelic. Language*: James Francis MacFarlane spoke Scotch Gaelic. Biography*: According to the 1891 Census James could read. [S9] Births, Church Record, June 1977 to September 1944 St. Joseph's Church, Margaree, Records, page 10, line 8. [S9] Births, Church Record, June 1977 to September 1944 St. Joseph's Church, Margaree, Records, page 16, line 18. [S571] 1891 Canada Federal Census, 101 Newbury Street, Boston, Suffolk, Massachusetts, USA, Christina is NOT listed with her father on the 1891 census. [S709] Diocese of Antigonish, Nova Scotia, Canada , Marriage record of Angus McGillivray & Christina McPharlan, page 163.